If you have tried with little success to learn to play the guitar or another stringed instrument, the ukulele may be for you. This four-stringed fun factory is quick and easy to learn, but before you rush out to buy your first ukulele there are few things that you should know. The most important thing is that they come in many sizes. When most people think of the ukulele they automatically think of a small instrument that is about 21 inches long. In fact, there are four sizes that you have to choose from, so if you have large clumsy hands don’t give up your uke dreams yet. Soprano, concert, tenor and baritone are the four sizes that you can choose from, with soprano being the smallest and baritone being the largest. Each size also has a different number of frets (tone intervals) giving the soprano the smallest range and the baritone the largest range. It is important to note that the baritone uke is a whole different beast from the other three. While the standard tuning of the soprano, concert and tenor are GCEA, the baritone is tuned to DGBE. This makes it easier for guitar players to learn since it has the exact same tuning as the bottom four strings of a guitar. 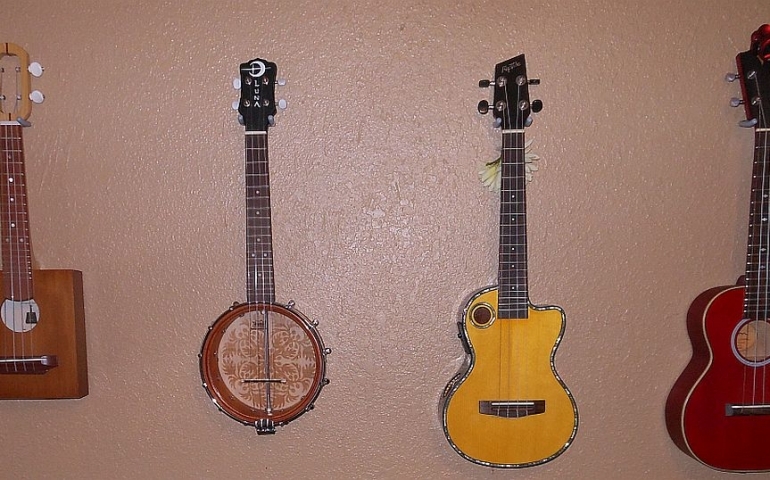 Just like the ukulele comes in different sizes, they also come in many shapes and types of woods. Standard guitar shape and pineapple are by far the most common, but there are hundreds of other shapes out there that are only limited by the builder’s imagination. Wood types can range from plywood on the low end of the price scale, to Hawaiian koa on the high end. The greatest advice that I could give to anyone taking up this hobby is to buy an instrument that you will want to pick up and play daily. While a $50 soprano might seem like a good idea, it might be a $300 tenor that lights a creative fire in you. Lastly, something you will hear from seasoned players is that playing the ukulele can be addictive, and that most players that stick with it will inevitable become a uke collector. With so many price points and styles it won’t be long until you’re wondering where your money and wall space went. The ukulele is easy enough to learn that you can teach yourself and small enough that you can take it anywhere. If you’re willing to take up the mission of spreading fun and happiness, the four-string revolution welcomes you.